Where do people first hear about EA? Where do people first hear about EA across time? Which Factors are Important for People Getting into EA? Where people first hear of effective altruism (EA) has changed over the years: 80,000 Hours is now much more influential, and Giving What We Can (GWWC) much less so. Personal Contacts, books, articles and blogs (other than those by major orgs) and 80,000 Hours seem to now be where most people first hear of EA. In each case, multiple options were presented by default, as well as an “Other” option with an open comment box. 2593 EA respondents answered the “How did you first hear about EA?” question. Note: images can be viewed more easily if opened in new tabs. Across our sample as a whole, Personal Contacts, LessWrong and 80,000 Hours stand out as the places where most people first hear about Effective Altruism, along with “Other” responses. No single route accounts for a particularly large portion of first contacts with EA. The largest single category (other than “Other”) Personal Contact, accounted for 16%. Thus, a wide variety of different sources seem significant for people first hearing about EA. We exploratorily coded the open comments accompanying the “Other” responses, creating new categories wherever a substantial number of responses seemed to fit into a given theme. 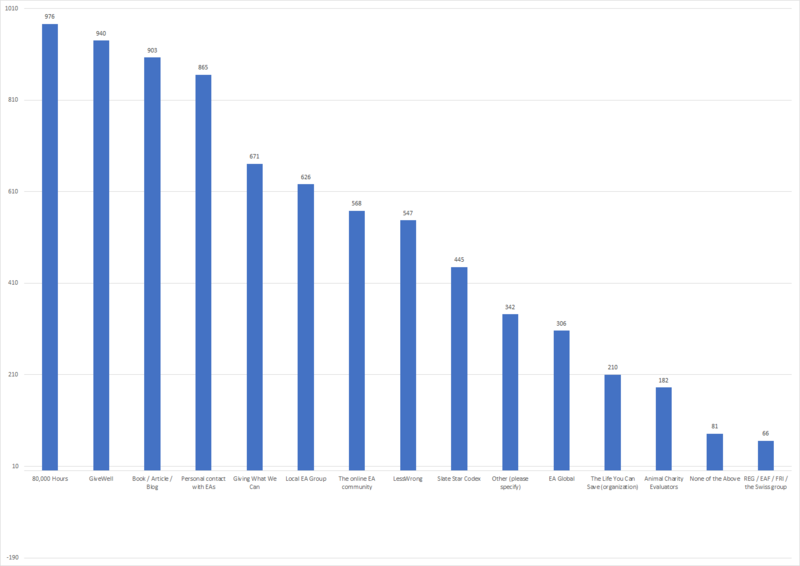 These cannot be directly compared to the numbers above, however, as while respondents were intentionally permitted only to select a single place where they first heard about EA, in the open comment box, many responses seemed to fit multiple categories and were coded as such. In addition, how individual responses should be coded is necessarily somewhat subjective. The largest category within the ‘Other’ responses by a very large margin was Peter Singer, with ~30% of all responses fitting this category. Of these, about 40% referred to a book by Peter Singer and 17% referred to a course, whether his MOOC or another university course where he was taught. However a majority of these did not fit either these categories or others (e.g. they just responded “Peter Singer”). 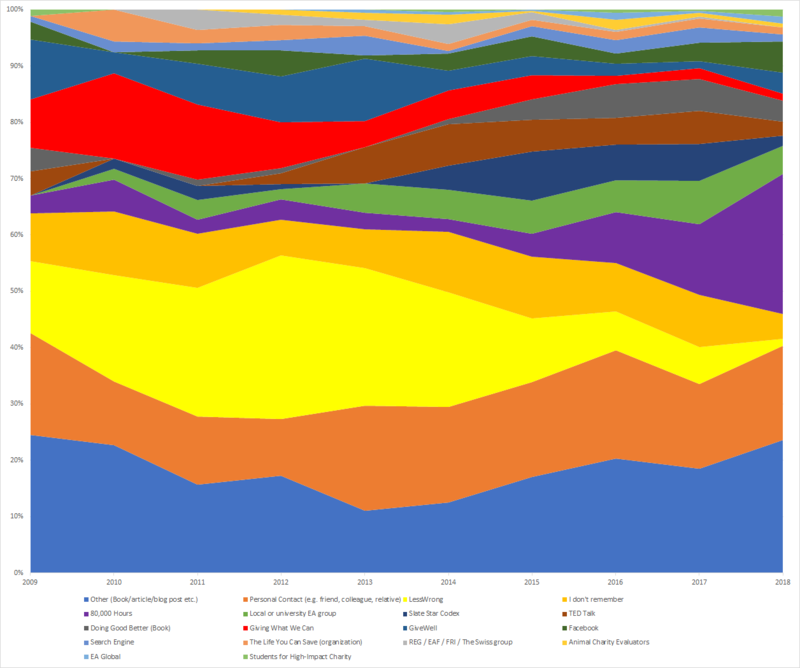 Approximately 19% of the open comment responses mentioned Podcasts (typically the Sam Harris or Joe Rogan podcasts), 15% mentioned Books, 10% mentioned Articles (online or in a newspaper), 9% mentioned a university or school Course, 7% a Blog, and 4% a Talk. 5% and 6% referred to an EA org that had already been included in the fixed response options (e.g. GWWC) and to a Personal Contact respectively. While the above section reported where people first heard about EA across our sample as a whole, where people first hear about EA seems to have radically changed across time. The full numbers of people reporting hearing about EA from different sources in each year can be viewed here. The following graph shows the proportion of people hearing about EA in each year who heard about it from different sources. The categories of ‘Other (book, article, blog etc. )’ (bright green) and ‘Personal Contact’ (bright blue) account for a large share of EAs across years (never lower than 10%). LessWrong accounts for very large percentages up until around 2015, at which point it begins to decline. At around the same time, SlateStarCodex begins to increase, perhaps representing some continued recruitment from the ‘rationalist diaspora’. One of the more striking changes is in the role of Giving What We Can (red) as a first point of contact for EAs. Giving What We Can seemed to have been one of the largest recruiters for EAs in the earlier years, but as early as 2012 appears to have drastically diminished in importance. After 2012, no more than 5% of EAs per year indicate that they first heard about EA from GWWC. Conversely, 80,000 Hours (purple) represents one of the most dramatic increases in our data. From 2016, the numbers of EAs reporting first hearing about EA from 80,000 Hours explode from 9% to 13% to 25%, making them the largest single source of EA recruitment in 2018. One important fact to bear in mind is that the number of EAs reporting hearing about EA in a given year has radically increased with time, from a little over 200 in 2009-2012, to 700 in 2017. As the 2018 survey was administered part way through the year, the numbers for this year are, of course, lower. As such, 80,000 Hours’ large share of people first hearing about EA in later years accounts for a very large number of EAs. For example, the number of EAs in our sample who report hearing about EA from 80,000 Hours in 2017-2018 alone is more than the total who heard from Giving What We Can across all years. This, of course, does not necessarily imply more or less impact, since recruiting EAs in earlier years may be more valuable. It is therefore also interesting to look at the changes in the total number of people hearing about EA from different sources, rather than simply the proportion hearing about EA from different sources, in order to see whether the numbers of EAs coming from different sources are actually declining in absolute terms. 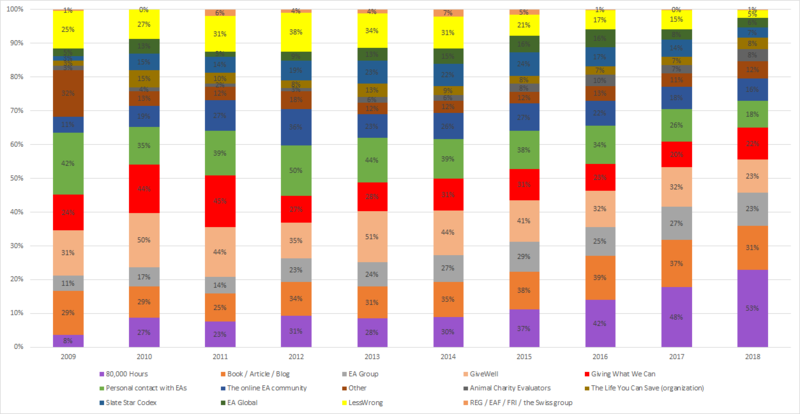 As the graph would be too crowded to read if we included all 18 sources, we removed those groups accounting for the smallest numbers of EAs overall (SHIC, EAG, ACE, REG/EAF, TLYCS, internet searches and Facebook). We excluded 2018 since fewer EAs had a chance to report first hearing of EA this year and so all the numbers are dramatically lower than in 2017. For the most part, numbers seem to be reliably increasing across sources, except for LessWrong and Giving What We Can, which decline in absolute terms, since 2015. For this question, individuals could select multiple options as being important for them getting into EA. 80,000 Hours, Books, Articles or Blogs, and Personal Contact appeared extremely influential here as well, though GiveWell was the second most commonly cited influence, followed by Giving What We Can, local groups, and the online EA community. There was also some change in the proportion of different cohorts of EAs (i.e. 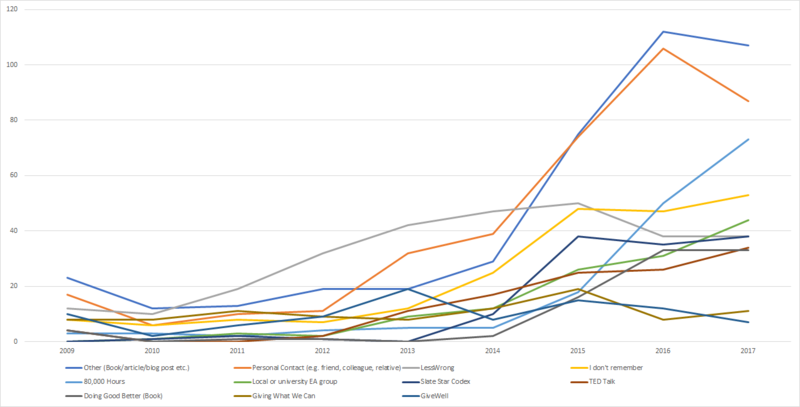 people first hearing about EA in different years) citing different influences as important. LessWrong appears to be cited more frequently among EAs who heard about EA in earlier years and less frequently by those joining more recently, whereas 80,000 Hours is cited much more frequently by those newer to EA. Indeed, around 50% of those who joined EA in 2017 or 2018 cite 80,000 Hours as important for getting them into EA. In future posts we will explore some further demographic factors and outcomes associated with hearing about EA from different sources. This post was written by David Moss. Analysis conducted by Rethink Priorities (David Moss, Peter Hurford and Neil Dullaghan). Thanks to Tee Barnett and Christina Rosivak for editing. The annual EA Survey is a project of Rethink Charity that has become a benchmark for better understanding the EA community.